Vibrations in the cabin of trucks with a platform can occasionally lead to substantial loss in driving comfort. 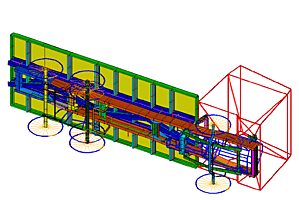 This was experimentally and analytically investigated on a truck with a long platform. Using correlation techniques, the natural frequencies and vibration modes up to 20 [Hz] of the entire vehicle could be determined for varying load conditions. Besides tilting and swaying of the cabin, which can be minimized by applying appropriate designs for the rear cabin suspension, yawing vibration shapes are substantially involved in the cabin vibrations. These can only be influenced with substantial technical efforts. The top figure illustrates one of these yawing vibration shapes. At 9.6 [Hz], this shows up in the first order of excitation at a high speed. It is also excited at lower speeds by the second order of excitation. The center figure shows the acceleration signal on the seat bracket illustrated as a waterfall diagram. 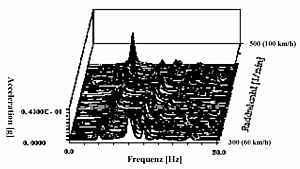 Both orders of excitation, as well as resonance rises between 7 and 12 [Hz], are clearly recognizable. This refers to yawing vibrations, that occur especially heavily in a fully loaded condition (26 [tons]). The yawing of the cabin is strongly coupled with the lateral bending of the platform. Only after a diagonal reinforcement of the platform (bottom figure), are the oscillation amplitudes within the 10 [Hz] range clearly reduced. It can be concluded that yawing vibrations is in general a characteristic of long trucks with rigidly connected platforms, leading to unacceptably high vibrations in the cabin, especially when the truck is fully loaded. 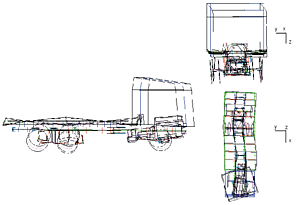 Rising demands on comfort require the development of principal concepts for decoupling cabin and vehicle frame.